Meet Our 2019 Peace River South Festival of the Arts Strings Adjudicator! Hannah Crisp grew up in a household that was never silent. Whether it was waking up to classical music, listening to rock ‘n’ roll while eating dinner, or her and her sister jamming on drums, guitars, or keyboards in the home, music is an integral part of her daily life. She began playing violin at the age of seven completing her Grade 10 Royal Conservatory of Music exams for the instrument while still in high school. As a youth, she performed violin in a chamber strings ensemble, played the flute in concert band, and played drums in a jazz band. A versatile performer in the performing arts, Crisp sang vocals in a jazz ensemble, chamber choir, and funk band on top of singing and dancing in several musical theatre productions. 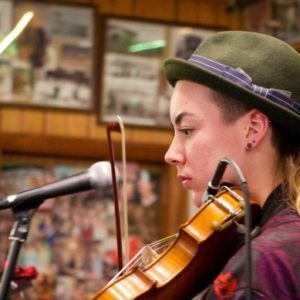 A post secondary graduate with her degree in Science from the University of British Columbia, Hannah auditioned for the UBC Orchestra and was accepted. For two years, Hannah had the honour to sit amongst music Majors – in front of the harps and beside the violas – giving life to celebrated symphony scores. Hannah Crisp is currently a Forrester for the Ministry of Forests, Lands, Natural Resource Operations and Rural Development in Dawson Creek. Regularly writing and producing lyrical songs, you can find Hannah at local venues in the Dawson Creek and surrounding area performing, jamming, and ever expanding her musical repertoire and skills. « Meet Our 2019 Peace River South Festival of the Arts Dance Adjudicator!